Common predators of sheep include bears, bobcats, lynxes, dogs, wolves, coyotes, wild pigs and mountain lions. Golden eagles are also known to prey on bighorn sheep. To ward off predators, mules or llamas are usually mixed in with sheep herds. Sheep are primarily raised as livestock throughout the world. 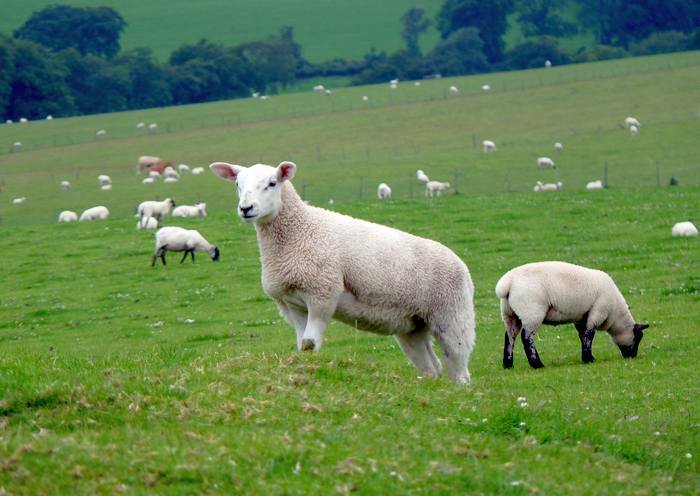 They are largely cultivated for the meat and wool they provide. These gentle animals are generally defenseless and usually huddle together for protection against their natural enemies. Due to their inherent vulnerability, sheep easily fall victim to larger animals. Grizzly and black bears are known to nearly devour an entire sheep. Bobcats naturally favor the hindquarters of sheep, while dogs go for the flanks, head and hindquarters of sheep when attacking. Wild pigs prefer lambs, while mountain lions prey on an average five to 10 sheep in a single hunting spree.